Originally published: New York: Viking. `Terrifyingly fun! Max Brallier's The Last Kids on Earth delivers big thrills and even bigger laughs.' Jeff Kinney, author of Diary of a Wimpy Kid`Forty-two days ago I was an ordinary kid, living an uneventful life. But now it's TOTAL MONSTER ZOMBIE CHAOS and I'm battling beasts on a daily basis. Crazy, right? But I know exactly how to make it through the zombie apocalypse. 'Meet Jack Sullivan, self-described as a late-blooming, slow-developing 13-year-old who has so far survived the Zombie apocalypse by hiding out in his treehouse. Overnight Jack's life has become like the plot of a video game and he has come up with his own ULTIMATE FEATS OF APOCALYPTIC SUCCESS:* Locate Quint Baker, best friend and inventor* Find and rescue June Del Toro, his secret love interest* Defeat Blarg, the biggest, baddest monster in town* Become a zombie-fighting, monster-bashing tornado of cool! The Simpsons meets The Walking Dead in the first book of a hilarious new monster adventure series. Fans of Timmy Failure, Wimpy Kid, Tom Gates, and Barry Loser will love accompanying Jack on his mission to become the post-apocalyptic action hero. With hilarious, action-filled illustrations from Douglas Holgate bringing the story to life on every page, The Last Kids on Earth will captivate even the most reluctant readers. Perfect for zombie-hunters of 8 years and upwards. 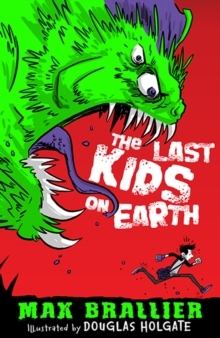 Look out for Last Kids on Earth and the Zombie Parade, coming soon!Max Brallier is the author of more than twenty books and games, including Galactic Hot Dogs, and the Eerie Elementary series, written under the pen name Jack Chabert. He lives in New York with his wife. Douglas Holgate is a Melbourne-based comic-book artist and illustrator, whose credits include Cheesie Mack, Case File 13 and Zoo Sleepover.